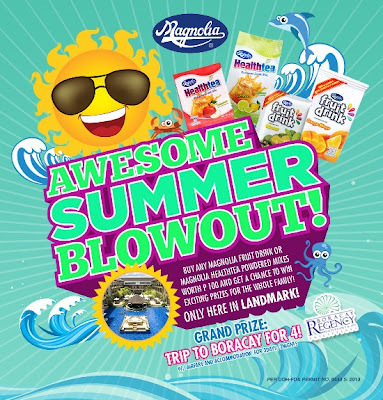 PROMO MECHANICS: Magnolia’s Awesome Summer Blowout Raffle Promo will run from March 15, 2013 to May 15, 2013. Landmark Supermarket customers who purchased at least P100 worth of Magnolia Fruit Drink and Magnolia Healthtea Powdered Mixes (single receipt) in participating Landmark Supermarket branches are entitled to avail one (1) raffle coupon. The participating branches are Landmark Supermarket Makati and Trinoma. Deadline of dropping of stubs is on May 15, 2013, until the closing hours of the participating Landmark Supermarket branch.